A: Any application can use notifications, as long as the app hooks into OS X's notifications feature. 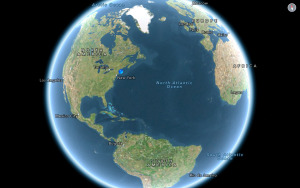 For starters, Apple programs such as Mail ( ), Calendar, Reminders, and Messages can display notifications. OS X's notifications take their cue from iOS. Here's a basic banner-style notification from Messages. Many third-party apps use notifications as well. If you’ve added your Twitter and Facebook logins to Mountain Lion’s Mail, Contacts & Calendars preference pane, you can see status updates and tweets. On my Mac, I also see notifications from Panic’s FTP program, Transmit; Red Sweater Software’s blogging tool, MarsEdit ( ); and Literature and Latte’s writer’s tool, Scrivener ( ), among others. A: Choose Finder > System Preferences (or click the System Preferences icon in the Dock) and click Notifications. Here you’ll see all your options. Click an application in the left-hand column of the Notifications preference pane to choose how to display its notifications. You make your decisions on an app-by-app basis; so first select an application from the list on the left. You can choose from three alert display styles: None, Banners, and Alerts. None means that you won’t see any notifications. Banners are the type of alerts shown in the first screenshot above; what is unique about them is that they display on your screen for just a few seconds and then disappear. 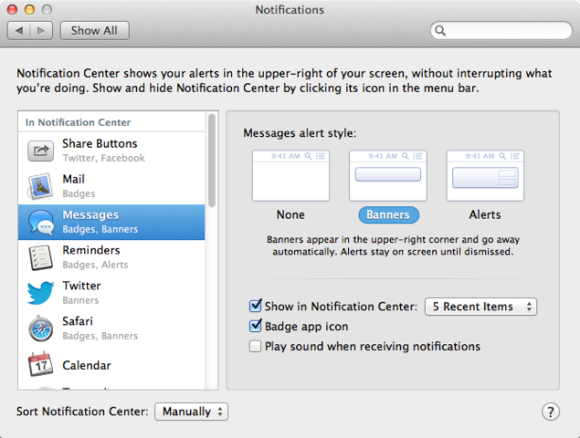 Choose this type of alert style for notifications you want to see when you’re at your Mac but don’t care about missing. Here's an alert-type notification. You must take an action by clicking one of the buttons before the alert will disappear. The last display style is Alerts. Like banners, these appear at the top-right of your monitor, but unlike banners, they don’t go away until you act on them. You can click the Close button to dismiss the alert, but you can also click the Show button to go to the application in question and see what just happened. In this example, you see an alert from the program Transmit telling me my file upload is complete. If I click Show, I’ll open Transmit and see that app’s window. If this were an alert for Mail, on the other hand, the Show button would display the email message the alert is telling you about; with the Messages app, clicking that button would show you the message; and so on. Whether you select Banners or Alerts depends on how important it is for you to be notified. Remember, Alerts won’t go away, so if you’ve left your desk, you’ll see these alerts when you come back. A: Yes. If you look closely, you’ll see more options in the Notifications preference pane, but the choices will change depending on which app you’ve selected. For example, click Calendar and you can choose how many items to show in the Notification Center. You can also choose to display information on the app’s icon badge—the little red circle with a number in it on the corner of the icon. You can also choose whether to have an alert sound played when a Calendar notification comes in. Click on Twitter in the list, and then click the Notifications button to get even more specific. You can, for instance, determine whether notifications will show mentions and replies from only people you follow or from anyone. A: So far, I’ve been talking about the alerts that display above your other windows, but there’s another place to see your alerts: OS X's Notification Center, a kind of sidebar at the right edge of your screen. Click the rightmost icon in your menu bar—the one with the three lines—to display it. Here's what the Notification Center looks like. The Notification Center offers a quick way to hop to applications that need your attention: Just click an item to open the parent application. Click an email notification, for example, and Mail will open to that message. To dismiss notifications in the Notification Center, click the X button to the right of an application’s name. OS X makes it easy to set up a keyboard shortcut for the Notification Center. There's already an item in the Keyboard preferences pane, just waiting for you to assign the shortcut of your choosing. 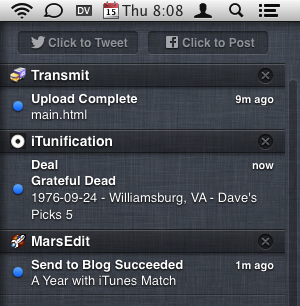 While there’s no keyboard shortcut to view the Notification Center set up by default, you can create one if you wish. 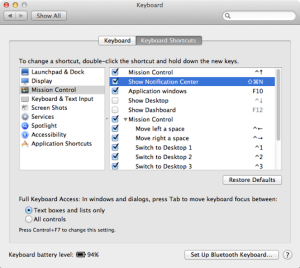 Go to the Keyboard pane of System Preferences, click on the Keyboard Shortcuts tab, and then select Mission Control in the left-hand column. You’ll see a Show Notification Center entry. Check the box, double-click the rightmost part of its line, and then enter your keyboard shortcut. Q: I’m overwhelmed by notifications. Can I get rid of them? A: If you get too many notifications, go to the Notifications preference pane and choose the None alert style for all the applications you don’t need to know about. Pare down your notifications to only those for the applications where they’re most useful. A: You can turn off notifications temporarily (until the next day) by Option-clicking the Notification Center icon in the menu bar. You’ll see the icon go gray. Also, if the Notification Center is visible, scroll down, and a Show Alerts and Banners toggle switch will display; use this to get the same result.